ACACIA: The acacia is a symbol of the immortality of the soul. ANEMONE: The anemone may be depicted in scenes of the Crucifixion, or in conjunction with the Virgin Mary to show her sorrow for the Passion of Christ. The red spots on the petals symbolize the blood of Christ, for it is said that anemones sprang up on Calvary the evening of the Crucifixion. In the early days of the Church, the triple leaf of this plant was used to symbolize the Trinity. Today most anemones are hybrids and few have the red spots. Here are two images, one a drawing, the other a close-up photo; in the first one can see the three-form leaf. This passage is interpreted as referring to Christ. As Christ is the new Adam, so, in tradition, the Virgin Mary is considered to be the new Eve, and, for this reason, an apple placed in the hands of Mary is also considered an allusion to salvation. Three apples are an attribute of St. Dorothea. ASPEN: There are two stories about the aspen tree. One says that the Cross was made from the aspen, and that, when the tree realized the purpose for which it was being used, leaves began to tremble with horror and have never ceased. Another is that, when Christ died on the Cross, all the trees bowed in sorrow except the aspen. Because of its pride and arrogance the leaves of the aspen were doomed to continual trembling. Whatever God's will for this tree, it is a scientific fact that the aspen leaf is a quaking or trembling leaf. BRAMBLE: The bramble was believed to be the burning bush which the Angel of the Lord appeared to Moses in Exodus 3. The bramble has become a symbol of the purity of the Virgin Mary, who bore the flames of Divine love without being consumed. BULRUSH [CATTAIL]: The bulrush is a lowly, thickly clustered, common plant, growing near the water. Thus it has become a symbol for the multitude of the faithful who live a humble life and obey the teaching of the Church, the source of living waters. This explanation is seen in Job 8:11, 'Can the rush be green without moisture? Or a sedge-bush grow without water?' Also, since the infant Moses [and Moses is taken as forerunner of Christ] was found in the bulrushes, they have come to be connected with the place from whence salvation came. CARNATION: The red carnation is a symbol of pure love. According to an old custom, a variety of carnation, the pink, was worn by the bride upon the day of her wedding, and the groom was supposed to search her and find it. From this custom, the pink has become a symbol of marriage. Newlyweds are often shown carrying a pink in their hands. CHERRY: The red, sweet fruit of the cherry symbolizes the sweetness of character which is derived from good works. It is often called the Fruit of Paradise. A cherry, held in the hand of the Christ Child, suggests the delights of the blessed. CHESTNUT: The chestnut in its husk is surrounded by thorns, yet is unharmed by them, and this is why it is a symbol of chastity: because this virtue is a triumph over the temptations of the flesh, symbolized by the thorns. CLOVER: The clover, with its three leaves, symbolizes Trinity. According to tradition, a clover was given as an example of the Trinity by St. Patrick, when he evangelized Ireland, and thus the clover, or shamrock, has become the emblem of Ireland. Another name for the three-leaved clover is trefoil. COCKLE: The cockle is a common weed that often invades the tilled fields and grows among with the planted grain. It symbolizes wickedness invading the good field of the Church. 'Let thistles grow up to me instead of wheat, and thorns instead of barley' [Job 31:40]. COLUMBINE: The form of this flower is compared to a white dove, and, for this reason, columbine has been used to symbolize the Holy Ghost. 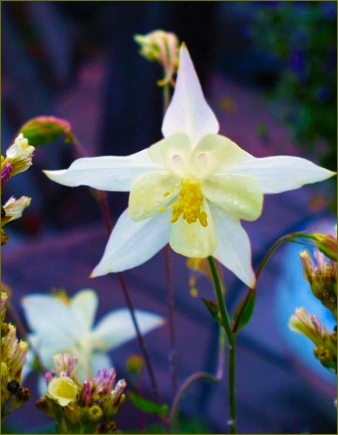 Columbine is derived from the Latin word for dove, columba. Seven blooms on a stalk were symbolic of the seven gifts of the Spirit, according to the prophecy of Isaiah 11:2. CYCLAMEN: This plant was early dedicated to the Virgin Mary, The red spot at the heart of the flower represents the bleeding sorrow of the Immaculate Heart. The cyclamen is sometimes called 'bleeding nun'. CYPRESS: The cypress, even in pagan times, was associated with death. It is found in many cemeteries, both Christian and pagan. Carvings depicting the cypress are found on many Christian tombs. There were several reasons for associating the cypress with death; for example, it has dark foliage and, once cut, it never springs up again from its roots. DAISY: Toward the end of the fifteenth century the daisy came to be used in paintings of the 'Adoration' as a symbol of innocence of the Christ Child because of the sweet simplicity of the daisy. DANDELION: This plant, which belongs to the category of bitter herbs, was used a symbol of the Passion, and as such was sometimes placed with flowers, in paintings of the Madonna an Child, and of the CrucifIxion. ELM: The stately elm represents the dignity of life. Its all-encompassing growth and the spreading of its great branches in every direction symbolize the strength which is derived by the devout from their faith in the Scriptures. FERN: The fern conceals its grace, delicacy, and beauty in the shadowed rescesses of the forest. Because the charm of this plant is seen only by the earnest searcher, the fern symbolizes solitary humility, frankness, and sincerity. FIG: The fig tree is sometimes used, instead of the apple tree, as the Tree of Knowledge in the Garden of Eden. The leaf of the fig tree appears in the story of the Fall in Genesis 3: 7, wherein the reference to its leaf, has become a symbol of lust. Its many seeds have made it also a symbol of fertility. FIR: The fir tree is a symbol of the elect in Heaven, who despise lowly desires. It also symbolizes people who excel in the virtue of patience. FRUIT: Fruit is often used as a symbol of the twelve fruits of the Spirit: Charity, Joy, Peace, Patience, Forbearance, Goodness, Benignity [Kindness], Mildness, Fidelity, Modesty, Continency, Chastity. GOURD: The gourd is prominent in the story of Jonah, and, because of this association with him, has come to symbolize the Resurrection. See Jonah 4. When painted together with an apple, the gourd, as the symbol of the Resurrection, is the antidote for the apple, the symbol of evil, or death. The gourd was used by pilgrims as a flask to carry water. It is the special attribute of St. James the Great, and of the Archangel Raphael and is sometimes given to Christ, Who, dressed as a pilgrim, joined the two Apostles on their way to Emmaus. Oftentimes, in art the gourd resembles a shot, yellow cucumber: See the Madonna image, The Madonna of the Taper with Fruits which was painted by Carlo Crivelli in 1490, above. GRAIN: Wheat, a well-known Eucharistic symbol, is used to suggest the human nature of Christ. This interpretation is based upon John 12:24-25: 'Amen, amen, I say you, except the grain of wheat falling into the ground die, Iself remaineth alone. But if it die, it bringeth forth much fruit.' Ears of grain and bunches of grapes are used to symbolize the Blessed Eucharist. See Grapes below. GRAPES: Bunches of grapes with ears of grain are symbols of Holy Communion. Representations of labor in the vineyard sometimes signify thc work of good Christians in the vineyard of the Lord; the grape vine or leaf is used as an emblem of the Saviour the 'true vine.' See Vine below. HYACINTH: The hyacinth is sometimes regarded as a symbol Christian prudence, peace of mind, and the desire for Heaven. This was derived from the myth of Hyacinthus, upon whose death the flower sprung forth. HYSSOP: This plant, which grows in solitary places among stones, is used to symbolize penitence and humility. Due to its purgative qualities, it is also taken to symbolize innocence gained and, hence, Baptism: 'Thou shalt sprinkle me with hyssop, and I shall be cleansed: Thou shalt wash me, and I shall be made whiter than snow' [Psalm 50:9]. ILEX [HOLLY]: The ilex, or holly oak, is an evergreen which, because of its thorny leaves, is regarded as a symbol of Christ's crown of thorns. It is also said to have been the tree of the Cross and, therefore, is symbolic of the Passion of Christ. Click the link above to read more. IRIS: The iris, a rival of the lily as the flower of the Virgin, appears as a religious symbol in the works of the early Flemish masters, where it both accompanies and replaces the lily in paintings of the Virgin. This symbolism stems from the fact that name 'iris' means 'sword lily', which was taken as an allusion the sorrow of the Virgin at the Passion of Christ. Spanish painters adopted the iris as the attribute of the Queen of Heaven and as an attribute of the Immaculate Conception. IVY: Symbolically, the ivy has always been closely identified with death and immortality. Because it is forever green, it is a symbol of fidelity and eternal life. The ivy, which clings to its support, is also a symbol of attachment and undying affection. Click the link above, for the Holly and the Ivy. JASMINE: The white color and sweet scent of the jasmine make it a symbol of the Virgin Mary. It also signifies grace, elegance, and amiability. LADY'S BED STRAW: This humble plant received its common name from tradition that some pieces of it were mingled with the straw in the manger where the Infant Christ was placed. LAUREL: The laurel symbolizes triumph, eternity, and chastity. The victor in ancient contests was crowned with a wreath of laurel. St. Paul contrasts this wreath with the imperishable wreath with which the victorious Christian is crowned in 1 Cor. 9:24-27. This, with the fact that laurel leaves never wilt, keeping their green foliage, makes it a symbol of eternity. Its association with chastity is thought to to stem from the ancients who took vows Virginity used laurel in the ceremony. LEMON: The lemon is a symbol of fidelity in love, and, as such, is associated with the Virgin Mary. she preserved amid the sins of the world. The Annunciation, is very much associated with lilies. In many of the scenes of the Annunciation executted during the Renaissance, the Archangel Gabriel holds a lily, or a lily is in a vase between the Virgin and him. Thus, the lily is also an attribute of the Saint Gabriel. Sometimes the Infant Christ is represented offering a spray of lilies to a Saint, symbolizing the virtue of chastity. As a symbol of chastity, the lily is the attribute of several Saints, among them St. Dominic, St. Francis, St. Anthony of Padua, St. Clare, and St. Joseph. The fleur-de-lis, a variety of lily, is the emblem of royalty. A fleur-de-lis was chosen by King Clovis as an emblem of purification through Baptism, and this flower has since become the emblem of the kings of France. This is why the flower is the symbol of St. Louis of France and St. Louis of Toulouse, both members of the royal house of France. The fleur-de-lis was also the emblem of the city of Florence. As an attribute of royalty, the fleur-de-lis appears on crowns and sceptres of kings and Saints, and is given to the Virgin Mary as Queen of Heaven. MYRTLE: The evergreen myrtle has from very early times been used as the symbol of love. In Catholicism the symbolism the myrtle is an allusion to the Gentiles who were converted by Christ. This interpretation is based upon Zechariah 1:8ff. NARCISSUS: The symbolism of the narcissus, which represents selfishness and self-love, coldness, and indifference, refers to Greek legend of the youth, Narcissus, who fell in love with own image when he saw it in the water and drowned while trying to embrace it. After his death, the youth was changed into a flower, the narcissus. This flower is sometimes depicted in scenes of the Annunciation or of Paradise to show the triumph of Divine love, sacrifice and eternal life over death, selfishness, and sin. OAK: The oak was one of the several species of trees that were looked upon as the tree from which the Cross was made. Because of its solidity and endurance, the oak is also a symbol of the strength of faith and virtue, and of the endurance of the Christian against adversity. God. As a token of peace, an olive branch is sometimes carried by the Archangel Gabriel to the Virgin Mary in scenes of the Annunciation. This symbolism was especially favored by painters of the Sienese school, to distinguish their art from that of Florence, which used the lily. ORANGE: The orange tree is regarded as a symbol of purity, chastlty, and generosity. Thus it is occasionally depicted in paintings of the Virgin Mary. The orange tree was sometimes used instead of the apple tree or the fig tree in scenes showing the fall of man. 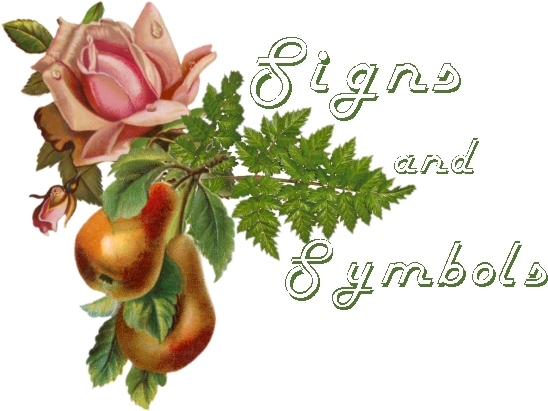 When it is seen in representations of Paradise, it alludes to the fall of man and his redemption. Its white flower is also used to suggest purity, and for this reason orange blossoms are the traditional adornment of brides. as a symbol of His triumph over sin and death. This symbol is taken from His triumphant entrance into Jerusalem before His Passion in John 12:12-13. A palm-tree staff is the attribute of St. Christopher, in reference to the his having uprooted a palm tree to support himself on his travels. After carrying Christ across the river, he thrust the staff into the ground, whereupon it took root and bore fruit. A dress made of palm leaves is an attribute of St. Paul the Hermit. PANSY: The pansy is a symbol of remembrance and meditation and is most often found on tombstones, rather than in paintings. PEACH: The peach is symbolic of the silence of virtue and of a virtuous heart and tongue. 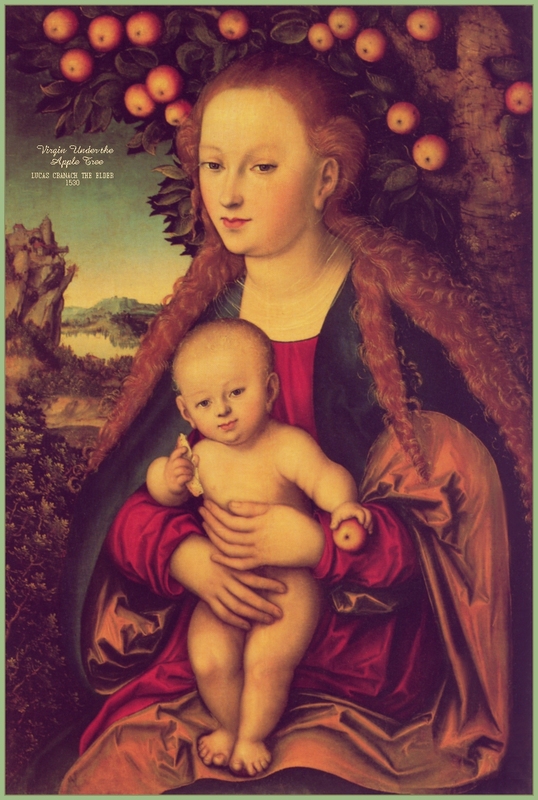 Sometimes it appears in paintings of the Virgin and Child, in place of the apple, to symbolize the fruit of salvation. PEAR: The pear frequendy appears in connection with the Incarnate Christ, in allusion to His love for mankind. PLANE TREE: The plane tree, which spreads its branches high and wide, has become a symbol of charity, firmness of character, and moral superiority. It is more specifically a symbol of the charity of Christ. PLANTAIN: The plantain, often seen in Renaissance paintings, is a common and lowly plant which thrives along roads and paths. It became known as 'way bread' and a symbol of the 'well-trodden path' of those who seek the path to Christ. PLUM: The plum is symbolic of fidelity, but it was most frequently used in Renaissance painting for decorative purposes. POMEGRANATE: In Catholic symbolism, the pomegranate as a rule alludes to the Church because of the inner unity of countless seeds in one and the same fruit. Because of its many seeds, it was also a symbol of fertility, and resurrection. It is often seen with the Virgin and Child. POPPY: The poppy is a symbol of fertility, sleep, ignorance, extravagance, and indifference all quite contradictory. It is sometimes depicted in reference to the Passion of Christ because of its blood-red color and its meaning of sleep and death. Cross, Christ was tendered a sponge soaked in vinegar on the end of a reed. It thus symbolizes the humiliation of greatness. It is also used to represent the just, who dwell on the banks of the waters of grace. The small cross carried by St. John the Baptist is commonly made of reeds. ROSE: In Catholic symbolism, the red rose is a symbol of Martyrdom, while the white rose is a symbol of purity since the earliest years of Cthe Church. St. Ambrose relates how the rose came to have thorns. Before it became one of the flowers of the earth, the rose grew in Paradise without thorns. Only after the fall of man did the rose take on its thorns to remind man of the sins he had committed and his fall from grace; whereas its fragrance and beauty continued to remind him of the splendor of Paradise. It is probably in reference to this that the Virgin Mary is called a 'rose without thorns,' because she was exempt from Original Sin. In Renaissance art, a garland of roses is often an allusion to the Rosary of the Blessed Virgin. The Glastonbury [also called the Christmas Rose] Rose is both the symbol for the Mother of God and for the Infant King, Who didst come to earth to be crowned with thorns as part of His Passion and Death whereby He renders atonement to God the Father for the sins of men, in order to win their redemption. The Glastonbury rose is an exquisite flower, without comparison, but it also bears the sharpest of thorns, like those that were plaited into Our Lord's Passion crown. Moreover, just as the Epiphany, which means manifestation, can be said to point to the Savior, so does this special Rose, which blooms just before dawn on January 6, the Feast of Epiphany. Nothing is coincidental with God. Before the Glastonbury rose came to be, Christians drew Mystical roses like a pointed star and crafted beautiful stain glass windows, depicting the Rose. They still do. Some quilters work entire quilts with the theme and there is a Mystical Rose quilt template. Wreaths of roses worn by Angels and Saints are indicative of heavenly joy. In accordance with a very ancient custom dating as far back as the time of Pope Gregory I, the sending of a golden rose by the Pope to people of distinction is a symbol of special papal benediction. An apron full of roses is an attribute of St. Elizabeth of Hungary, while a basket of roses and apples is used to identify St. Dorothea of Cappadocia. STRAWBERRY: The strawberry is the symbol of perfect righteousness, or the emblem of the righteous man whose fruits are good works. When shown with other fruits and flowers, it represents the good works of the righteous or the fruits of the Holy Spirit. It is in line with this meaning that the Virgin is sometimes shown clad in a dress decorated with clusters of strawberries because is the Spouse of the Holy Spirit. The strawberry is occasionally shown accompanied by violets to suggest that the truly spiritual are always humble. THISTLE: The thistle is the symbol of earthly sorrow and sin because of the curse pronounced against Adam by God, in Genesis 3: 17-18. The thistle is a thorny plant, and because of its connection with thorns in the passage referred to above, it has also become one of the symbols of the Passion of Christ, and particularly of His crowning with thorns. THORN: Thorns and thorn branches signify grief, tribulation, and sin. According to St. Thomas Aquinas, thorn bushes suggest the minor sins, and growing briars, or brambles, the greater ones. The crown of thorns with which the soldiers crowned Christ before the Crucifixion was a parody of the Roman emperor's festal crown of roses. The tonsure of the priest is a reverent allusion to this thorny crown. The Glastonbury Thorn, because it is found on the rose of the same name symbolizes the coming Passion of Christ in reference to the Christ Child, the reason for His Nativity. TREES: The tree has played an important part in Christian symbolism. In general, the tree is a symbol of either life or death, depending upon whether it is healthy and strong, or poorly nourished and withered. Genesis 2:9 describes how the Lord planted the Garden of Eden. Genesis continues to relate that the fall of man resulted from Adam's partaking of the fruit of the Tree of Knowledge. The flowering tree is used as an attribute of St. Zenobius, with reference to the legend of the dead tree that burst into leaf at the touch of the Saint's dead hand. Tree of Jesse. 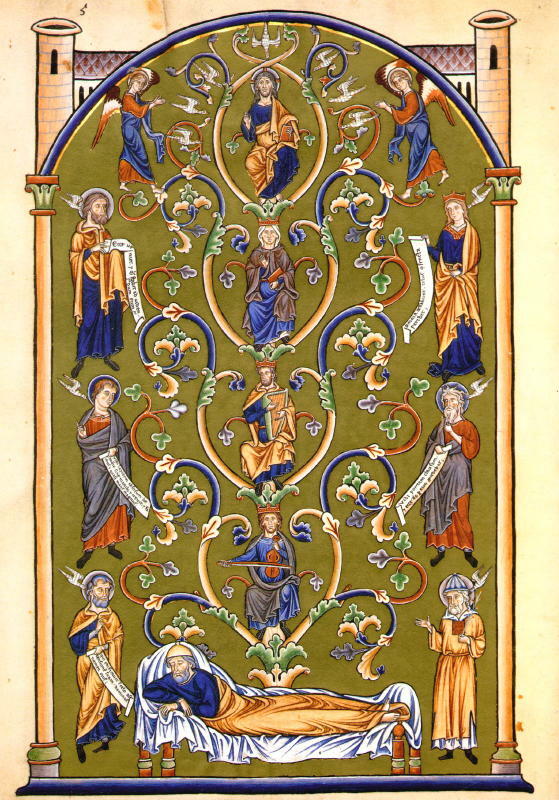 The genealogy of Christ, according to the Gospel of St. Matthew, is frequently shown in the form of a tree which springs from Jesse, the father of David, and bears, as its fruit, the various ancestors of Christ. Usually the tree culminates with the figure of the Virgin bearing her Divine Son in her arms. The representation of the Tree of Jesse is based upon the prophecy of Isaiah 11:1-2, 'And there shall come forth a rod out of the stem of Jesse, and a flower shall rise up out of his root: And the spirit of the Lord shall rest upon Him . . .' The presence of the Crucified Christ in the Tree of Jesse is based on a medieval tradition that the dead tree of life may only become green again if the Crucified Christ is grafted upon it and revives it with His Blood. The presence of the Virgin Mary alone at the top of the Tree of Jesse alludes to her Immaculate Conception. In place of a tree, sometimes the vine, a Eucharistic symbol, can be found. VINE: The vine is one of the most vivid symbols in the Bible and is used to express the relationship between God and His people. The vine sometimes refers to the Vineyard as being the protected place where the children of God----the Vines----flourish under the tender care of God, the Keeper of the Vineyard. [Isaiah 5:7] The vine was used as the symbol of the Church of God, in which, alone, this relationship exists. VIOLET: The violet is a symbol of humility. St. Bernard describes the Virgin Mary as the 'violet of humility.' It is also used to denote the humility of the Son of God in assuming human form. White violets are an attribute of St. Fina, whose resting place, after her death, was found covered by these flowers. WHEAT: Wheat is used to suggest the bounty of the earth, but, in relation to Holy Communion, it symbolizes the flour used to make the Host for the Consecration at Holy Mass. WILLOW: The willow continues to flourish and to remain whole, no matter how many of its branches are cut. Therefore, it has come to be a symbol of the Gospel of Christ, which remains intact, no matter how widely it is distributed among the peoples of the world.